In recent times, I’ve noticed a needless craze, in which some are desperate to fit more and more into their gardens. Our aspirations have strayed far from the humble picket fence… and now incorporate all sorts of glorious outdoor amenities. Yes, there are some essentials we need to consider, but far too often garden is sacrificed for superfluous and unnecessary, well, ‘crap’. Are we unintentionally creating an amenity-packed holiday park in place of a garden? I believe in some sad cases that’s the result. I blame those DIY reno shows which have given us unrealistic and unsustainable expectations. What looks ‘good’ (I write with a gritted teeth) on TV does not necessarily equate to thoughtfully designed spaces with real longevity. We need to remember that gardens are long-term, whereas the current interior trends including horrible brass baubles will fall by the wayside. The best advice I have for small garden spaces is to keep it simple. This requires thought – what do I actually need? Must I have the large outdoor entertaining zone with four built-in fridges, the pizza oven and the double decker smoking bbq likely used only once a year (in the interim becoming a breeding ground for eight-legged creatures)? Or am I perfectly content in using the kitchen I’ve just had renovated conveniently located a few steps away inside? 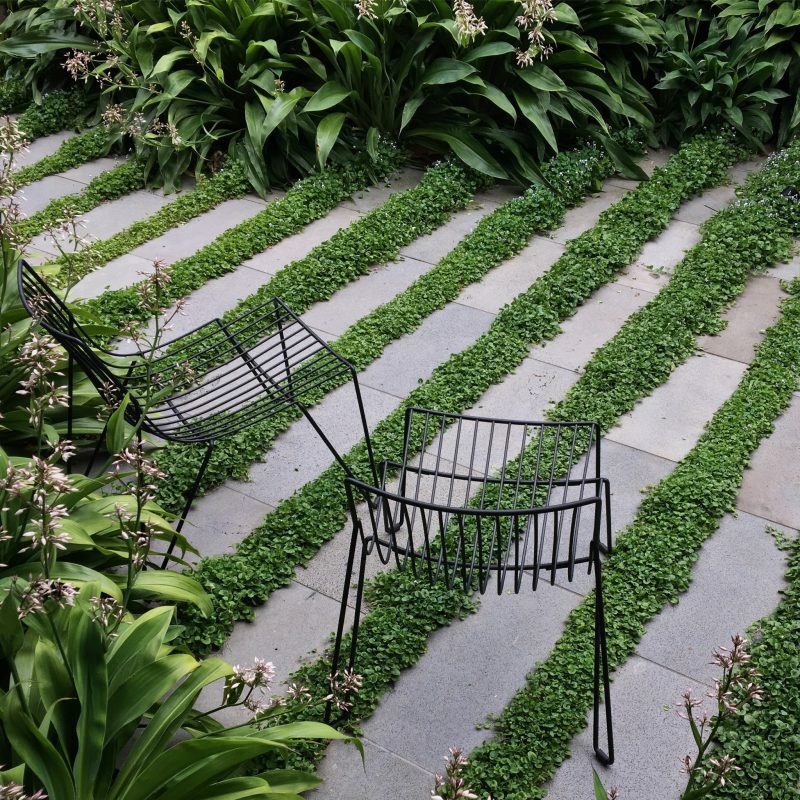 Perhaps we should go back to basics – let a garden be a garden. There’s no reason why a small space cannot be fully planted. While there is beauty in seasonality and I’m definitely an advocate for gardening for enjoyment, not everyone agrees. 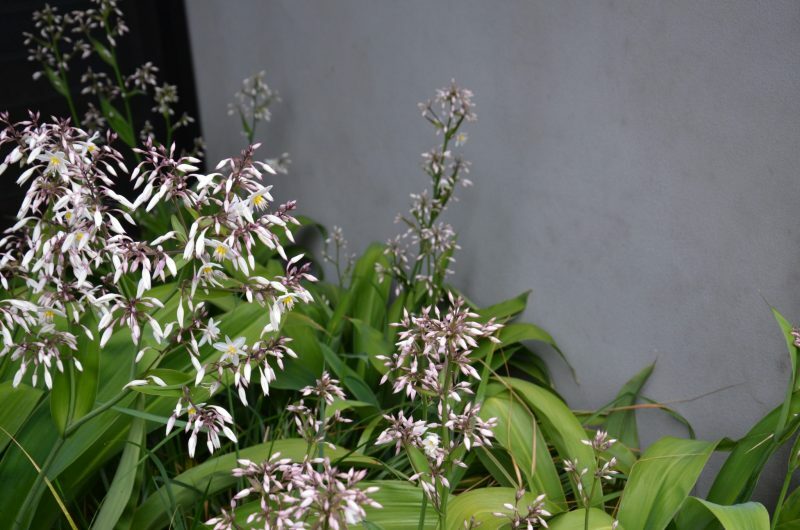 Less plants doesn’t necessarily equal lower maintenance and so the key to achieving the right balance between having a garden and time for a garden is to use a refined palette of robust plants. Let them sit there, grow and do their thing without constant intervention. Here we extended on a ‘traditional Malvern’ palette – nothing too out there and used en mass for impact. Perfect against the contemporary addition by Figure Ground Architecture. Built-in furniture? Not here..My advice would be to opt for well designed and classic pieces which become recessive in the space. This way they shouldn’t date – if they do? you can replace them. Lightweight furniture can also be moved, this offers greater versatility and the ability to chase the sun in small spaces. Restraint can also be applied to the use of materials. 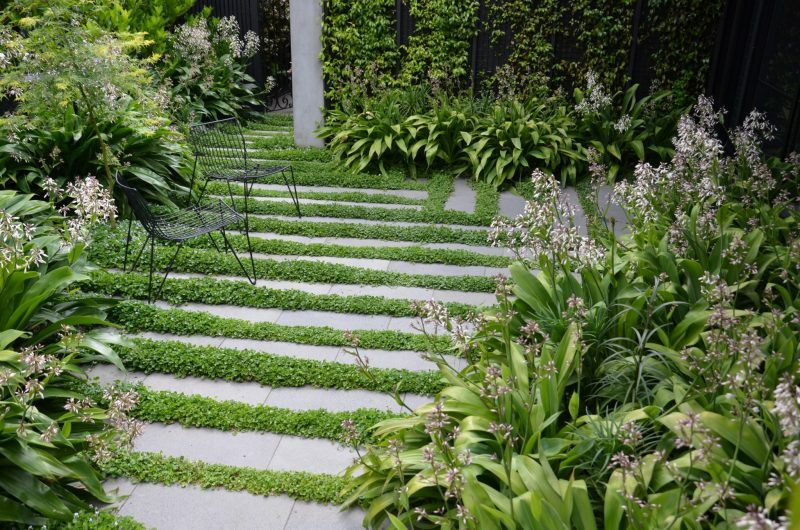 Instead of opting for a small patch of lawn, a decked area, and a paved path, consider the use of one versatile and ‘uniform’ surface. Pavers with ground cover between, still act as a solid usable surface; welcoming the dining setting, trampoline and a soccer ball. It’s also practical for pets, children and high traffic. 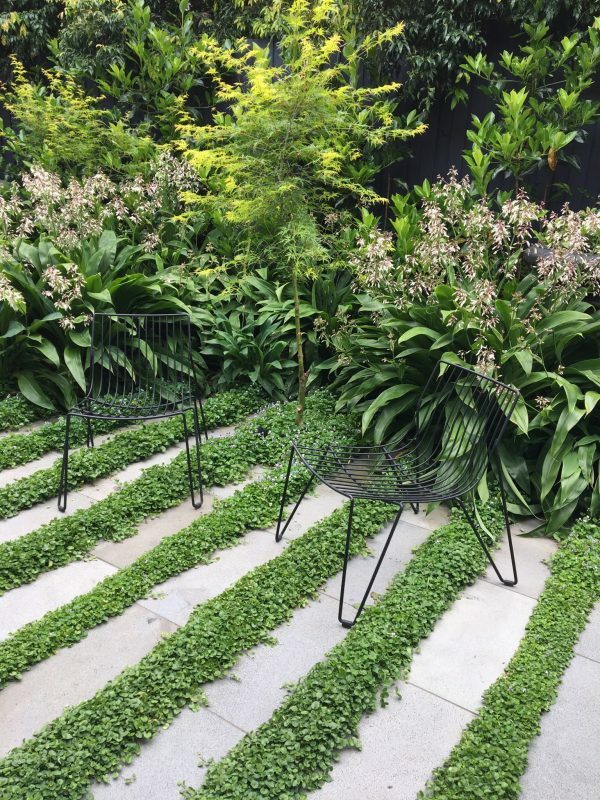 The material we choose can also offer a sense of space; long rectangular pavers can draw the eye into the space.. 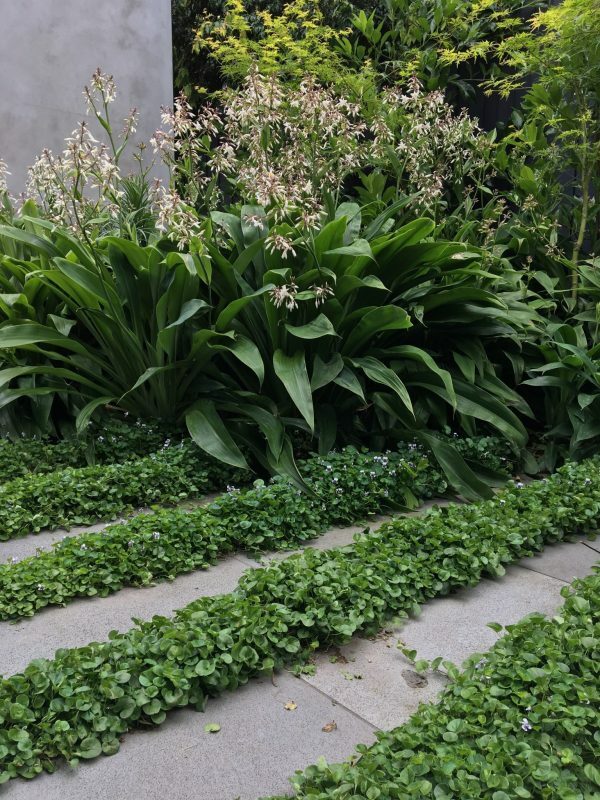 Incorporating planting between the paving along with a ‘staggered’ edge blurs the definition of both garden and paving, extending both. We’ll have to wait and see. Until then, let’s enjoy gardens for what they are. Beautifully written and I agree totally with your sentiments on the unfortunate influence of DIY TV shows. It makes me disappointed when so much emphasis in placed on hardscaping and creating a ‘built environment’ rather than a soft, timeless garden.